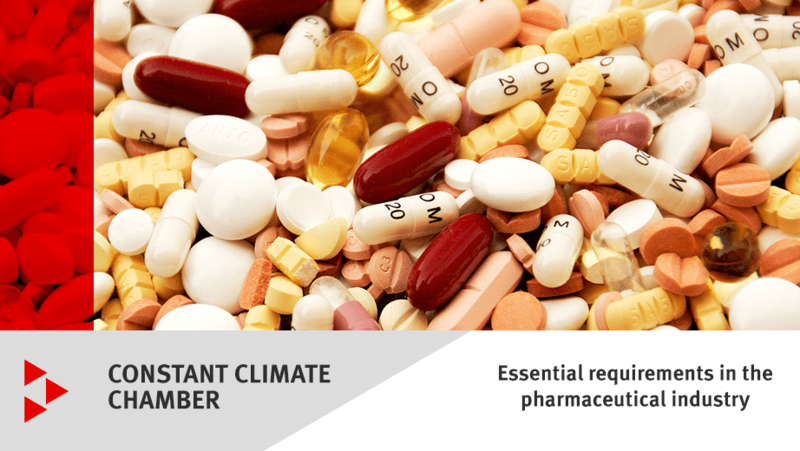 Stability testing of new active pharmaceutical ingredients and products in accordance with the ICH Q1A(R2) guideline and photostability testing to Q1B(R2) generates important data for approval applications submitted to the relevant health authorities. In this blog, we will be describing technical aspects that are of particular significance when conducting stability testing in accordance with ICH guidelines or other international or company-specific standards. Stability and photostability testing is used in studies targeted at providing information on how the active pharmaceutical ingredient (API) or the finished pharmaceutical product (FPP) changes over time subject to temperature, climate, and light. Follow-up inspection deadlines for the active pharmaceutical ingredient, expiry dates, and recommended storage conditions are determined on the basis of this data. Constant climate chambers are key when it comes to carrying out these studies. The Q1A(R2) guideline has been in effect since 2003 and the Q1B since 1996. In the meantime, constant climate chambers have undergone huge developments. Accuracy and reproducibility of parameters, reliability, and durability in continuous operation are the top priorities for a constant climate chamber. The robust stainless-steel interior should be corrosion-resistant and designed so that it is easy to clean. Programming must be intuitive and documentation must meet the requirements set out by the FDA 21 CFR Part 11 regulation. Calibration certificates, data loggers, and validation documentation should of course also be included. What technical solutions are currently available in order to fulfill these requirements? To which factors must I pay particular attention? What are the advantages and disadvantages of the various technical solutions? This blog offers you an initial insight. Temperature-humidity charts provide a quick overview of all attainable temperature and humidity values as well as climate conditions. The performance ranges of the different constant climate chambers vary considerably. For example, as well as meeting all the climate conditions stipulated by the ICH guidelines, some models also satisfy those of the five climatic zones I to IVb. Such models are extremely versatile and, if required, can be used in conjunction with each other as universal backups. Other models simulate only certain climate conditions and therefore have a very limited range of application. In the case of horizontal airflow, air diffuses evenly over each shelf, irrespective of the shelf's position in the climate chamber. Optimal temperature and humidity distribution is achieved when the chamber is loaded. This is especially true in the case of a double-sided, horizontal airflow. In the case of vertical airflow, i.e., from bottom to top, air diffuses through the shelves, starting from the bottom, working its way upward to the middle, and finally reaching the top shelf. Even air distribution is essentially hindered by each shelf. Restrictions in the structure of the FPP are the result. In the case of photostability testing in accordance with ICH Q1B, light supplements temperature and humidity as an additional parameter. Light sources and illumination levels for each time unit are specified. The visible light (VIS similar to ISO 10977 (1993)) must reach an exposure period of at least 1.2 million lux per hour and near ultraviolet must be at least 200 h/m² (320 nm to 400 nm). As is the case for temperature and humidity, uniform light distribution over each shelf is of paramount importance. Here, the essential specifications are the distance for the intensity, as well as the type of sensor and the reflectors that are used. As with temperature and humidity, the light must be programmable and the documentation must satisfy the FDA 21 CFR Part 11 regulation. It is not just the type of humidification that is important – the water that is supplied to the constant climate chamber also has to be of good quality. Connection to a water supply and drainage facility on site is one option, while using large-volume water canisters to supply fresh water and collect wastewater directly at the constant climate chamber is another. The latter option enables the chamber to be installed far away from an on-site water supply. Ion exchangers prepare the fresh water to the requisite quality in both cases. Constant climate chambers run for well over 8,000 hours per year in continuous operation. Robust designs, long-lasting materials, and components developed to deliver maximum reliability are the foundations, assuring that these demanding running times are maintained over many years. To minimize the risk of time-consuming cross-contamination and biological contamination inside the constant climate chamber, an easy-to-clean interior is absolutely essential. High-alloyed, monochromatic stainless steel, rounded corners, autoclavable shelving, steam humidification, and an absence of synthetic materials in the interior are just some of the key aspects. Some models also have an extended temperature range of up to 100°C, meaning that sterilization is possible. An important factor with respect to the approval application is the availability of complete and end-to-end documentation of all relevant parameters for each and every operating state. Documentation is to be maintained in accordance with the FDA 21 CFR Part 11 regulation for electronic records and electronic signatures. It goes without saying that calibration certificates for temperature, climate, and light, data loggers (process documentation for independent data recording), and validation documentation with IQ (installation qualification), OQ (operation qualification), and PQ (performance qualification) are also required. Further important guidelines have been published by the World Health Organization (WHO): “Stability testing of active pharmaceutical ingredients and finished pharmaceutical products”. As examples, guidelines have also been published by the following organizations: the Food and Drug Administration (FDA) in the USA, the European Medicines Agency (EMEA), and the Ministry of Health and Welfare (MHW) in Japan. For active pharmaceutical ingredients in veterinary medicine, VICH GL3(R) “Stability Testing of Veterinary Drug Substances” and VICH GL5 “Photostability Testing of New Veterinary Drug Substances and Medicinal Products” serve to describe corresponding stability testing.